There are so many choices out there when it comes to blogging platforms (the software you choose to create your blog), it is sometimes difficult for the beginner to know which is the right one for them. There are several factors to consider in making that choice, including ease of use and your own skill level with computers, and the Internet in particular. You would also want to consider the purpose of your blog and how visuallly oriented you want it to be, as well as whether you are bloggingn for fun or for profit. This is a very easy platform to use and offers the ability to incorporate images, as well as text and videos. It also has a wide variety of themes so you can individualize your blog page. Tumblr is accessible through your mobile devices, i.e., smart phone or tablet. The downside is the same as its positive: it’s more image oriented than narrative/text oriented, so you would want to decide which will play heaviest into the goals you have for your blog. There are some beautiful Tumblr pages out there though, so I recommend some browsing before any decisions are made. Another user-friendly platform is WordPress. This is another popular platform offered for free. 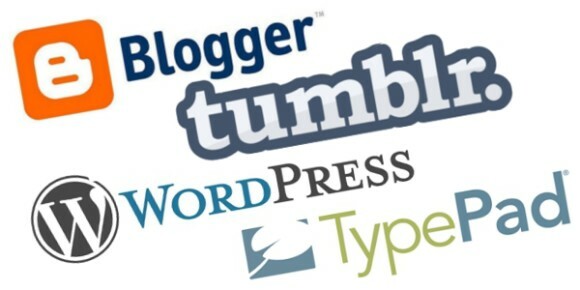 In fact, WordPress has the distinction of representing one of every six blog websites. It’s content managing system runs from the most simple for the casual or hobby blogger to some very complex features for more expert bloggers. You will find the Wall Street Journal and People Magazine among its users. It is easy to customize the appearance of your blog using its extensive theme library and thousands of plugins. It also offers excellent video tutorials to assist the novice.